Ellen Easton has shared with us her recipe blend for Green Mint Chai tea featured in her Springtime Celebration luncheon menu. The mint added to the chai blend lends a Mediterranean twist with a refreshing flavor that can stand alone without milk. 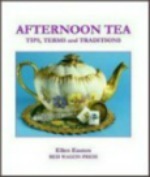 This is an especially excellent tea to accompany a spicy meal or serve to a gathering of friends. The Green Mint Chai tea blend consists of the foundation of green tea leaves combined with ginger, cardamom, clove, cinnamon, nutmeg, and fresh mint leaves blended together and steeped in a pot of tea. Green mint chai tea can be served hot or enjoyed as an iced tea. *Gunpowder tea, also known as pearl tea, is a form of Chinese tea where each leaf has been rolled into a small round pellet. The name comes from it's resemblance to grains of gunpowder. This rolling method is most often applied to green tea leaves and allows them to retain more flavor, caffeine and aroma. As the tea is steeped in hot water, the balls of tea leaves will unfurl. When purchasing gunpowder tea, look for shiny pellets which indicates the tea is relatively fresh. The size of the pellets also indicates the quality of the tea. Smaller tightly rolled pellets indicates a higher quality tea using younger and more tender leaves. Gunpowder green tea can be found in most local supermarkets or gourmet grocery stores. Place all dry ingredients (green tea, ginger, cardamom, clove, cinnamon, nutmeg, black pepper and mint leaves) into a bowl and mix together until well blended. This will form the tea blend. Next, place the tea blend ingredients into the bottom of a teapot. In a saucepan over high heat, add water and bring to a boil and remove from the heat. Do not over boil or bring to rolling boil. Pour hot water over the dry ingredients in the teapot. Cover and steep for five minutes. Decant the leaves by straining through a sieve or tea strainer into a clean teapot and serve hot. This blend may also be served iced. Enhancers: Sugar, Honey or Vanilla bean. Milk is not served with green tea.